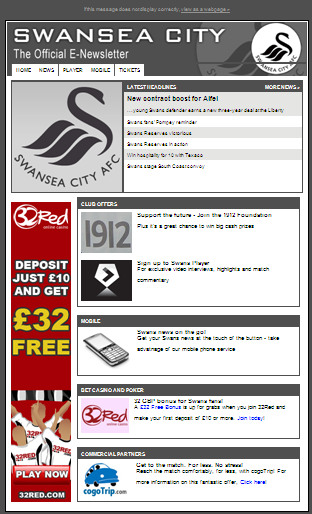 Analysis Marketing: Can Swansea City be Premier League off the pitch too? Can Swansea City be Premier League off the pitch too? Today saw the publication of football fixtures for next season and so the excitement from Swansea’s play-off victory is ratcheted up another notch as fans (including myself) start to pencil in visits to Eastlands first then the Emirates, Stamford Bridge and beyond. With the riches that accompany the Premier League comes a greatly increased profile and an opportunity to maximise off-field earnings as well as those from TV and gate receipts. This isn’t about bleeding supporters dry, it’s about engaging with supporters through the means of targeted and relevant content (both Online and Offline). Although it feels like treason to say it, I don’t think Swansea have done great things on this front so far. Regardless of what’s been going on this season, the only contact has been a weekly email every Friday afternoon which has a couple of one line teasers to content on the website with the rest of it being advertisements. It could be argued that the aim of a newsletter is to drive people to the website and so content in the newsletter isn’t crucial. Unfortunately, in my opinion the content in the newsletter is so bland that I rarely bother opening them as I know that I’m better off just looking at the website directly now and again (I’m sure in plenty of cases however people will neither open the email or visit the website). One example of where this may have helped is after sealing promotion they announced the sale of a final batch of 2,000 Season Tickets. Rather than being able to determine those who may be more deserving of the opportunity of buying these tickets, it was announced on a Thursday afternoon that they were going on-sale at the club ticket office at 10 a.m. the next day, in-person sales only. This meant that those season tickets just went to the first people who could get down to the ticket office and didn’t have to worry about work the next day. Some would say that real fans would have bought their Season Tickets already but there will be others who would argue they have been forced out by those jumping on the bandwagon. Which of course is where we come in, so if there’s any football clubs out there who are looking to get more from their data then get in touch. I know that the club want to do more for sure off the field but the blog above is not strictly correct. The email you see above is one that is sent out automatically and is the same for all league clubs. This goes out to an ever growing database of users but the club are working to allow more to be added to this. James, it’s a fair point to make that I’m not aware of all communications that Swansea send out. It does for me however highlight where I think Swansea have been missing a trick in that there are probably plenty of people like me who get the standard email, visit the website and have used the club shop/ticket office but who don’t get these other communications. As the first poster says, Rome wasn’t built in a day and they are getting it right in the most important area which is on the field. This season offers huge opportunity and I hope they make the most of keeping supporters engaged.